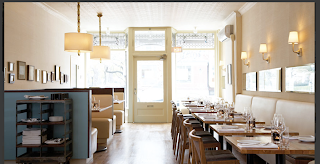 Whenever I think about Grace I always think about Xacuti first - the former restaurant that existed in the same space. When Xacuti was open it was one of the most buzzed about and best brunch spots in Toronto. Equally buzzed about Grace, definitely lives up to its former inhabitant's reputation. The space itself is open, warm and relaxing. (image taken from www.gracerestaurant.ca) And even more relaxing - the fresh warm bread brought to the table. With the guarantee from our server Grace's seafood is brought in daily from the east coast, we ordered the new england clam chowder with homemade biscuits and the slow cooked scallops with braised leeks to start. Both dishes were delicious. Check out that foam on top of the chowder. Next up and to finish the meal off was the house made papardelle ragu with braised beef. The service was great, the food delicious and a warm welcoming space, Grace is a winner and I wouldn't hesitate to go back.